If you’ve ever had your wallet stolen or discovered that someone has hacked into your personal information online, you understand how time-consuming and annoying identity theft can be. Canceling your credit cards, putting a hold on any outstanding checks, getting a new Social Security card and jumping through hoops to get the money back that someone spent on your behalf isn’t fun. While identity theft is a threat year-round, tax-related identity theft is a growing problem this time of year. Tax-related identity theft occurs when someone uses your stolen Social Security number to file a tax return claiming a fraudulent refund. You may be unaware that this has happened until you file your return and discover that a return has already been filed using your SSN. Or, the IRS may send you a letter saying it has identified a suspicious return using our SSN. You’d think that if someone was going to put forth so much effort to steal your tax identity that they’d at least have the courtesy to pay your tax bill, right? Instead, they have eyes for your big tax refund check. Yes, the one you’re counting on to pay for this year’s family vacation or as a nice down payment on a new car. Fortunately, there are some simple ways you can prevent the crooks from swiping your money – and identity. Not only will these save you money, but they will also save you months and months of phone calls and headaches while trying to straighten out the mess. 1. Don’t let the IRS owe you a big refund. A big chunk of change each spring sounds great. But why wait to have access to that money? You can reduce the withholdings from your work paychecks so that instead of waiting around for a big check later (the crooks are waiting on it, too), you can have that money now. If you’re not used to that “extra” cash, sock it away in a savings account and pay yourself later. 2. Secure important documents. Store your important papers, like Social Security cards, in a safe and secure location, and don’t discard any documents with your SSN on them. Copies of tax returns should be kept in a locked file cabinet or safe. Also, resist giving businesses your SSN or other personal information just because they ask for it. Often, it is not required, and giving out this information is risky. 3. Protect online information. You should protect personal computers by using firewalls and anti-spam or anti-virus software, updating security patches, and regularly changing passwords for Internet accounts with sensitive information, such as online banking sites. Do not make passwords simple enough to guess, like your address, birthday, wedding anniversary, etc. 4. Hire a professional accountant. The IRS is continually looking for better ways to protect taxpayers against tax identity theft. Unfortunately, there are still some who fall for email phishing scams and bogus websites, which attempt to steal their information. Certified Public Accountants (CPAs) are highly trained in tax preparation and have direct access to many important resources through the IRS that can help educate clients about avoiding and dealing with identity theft. 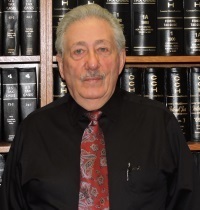 Alfred Fricano can be reached at 330.385.2160.